Industry Connections, will you be there?? Everybody deserves a chance to fulfill a dream or passion. Many times a person chooses to not pursue the things they want to do because of lack of knowledge or lack of tools. It’s never time or money. People make time for the things they want, and people find money for the things they want. If you’re a person that has decided to “want” something but need help, you should attend this event. If you are a current business owner or you have an established talent, you should attend this event. Not only will you get direct suggestions, advice, and knowledge but you get an opportunity to build on your ideas. You also get to network with other individuals that have a similar focus. There will be speakers, a question and answer session, and time to network. There will be food and beverages available. November 2nd is the date and start time is 7pm. Please adjust your schedules to arrive on time! One of the most important aspects of networking is having a business card. Even if you do not yet have a business, you can still have a business card with your name, your email address and your phone number. We are asking all guests to bring 100 business cards to the event. Nobody should have to say “sorry I don’t have a card”, when attending a professional event such as this. Please dress in business attire or business casual (Men, no sneakers, no t-shirts, no hats. Ladies, please no outfits that are too revealing. Dress code will be strictly enforced at the door). One of our confirmed guest speakers is the owner of Eleven16 Media, Damon Thomas. An Atlanta based company, they specialize in video production and photography. Commercials, ariel photography, product video, music video, acting reels, television shows, movies, they do it all. Visit their website at http://damonlthomas.com/. Another speaker is a young woman that has worked very hard to establish herself as a professional in the city of Atlanta. She is the owner of two law firms and is personally involved with other successful ventures. Michelle Simpson will be speaking regarding the importance of having your company legal in all aspects. Visit her website at www.poesimpsonlaw.com. Information on other speakers will be added over the next few weeks, so please visit the page from time to time. 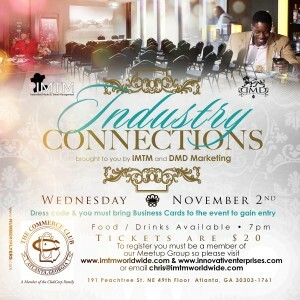 Please forward your name and email so you can be added to the Industry Connections Meetup Group and get ticket information so you can reserve your seat! We at IMTM and DMD Marketing are very excited about Industry Connections, hope to see you there! Get Connected. 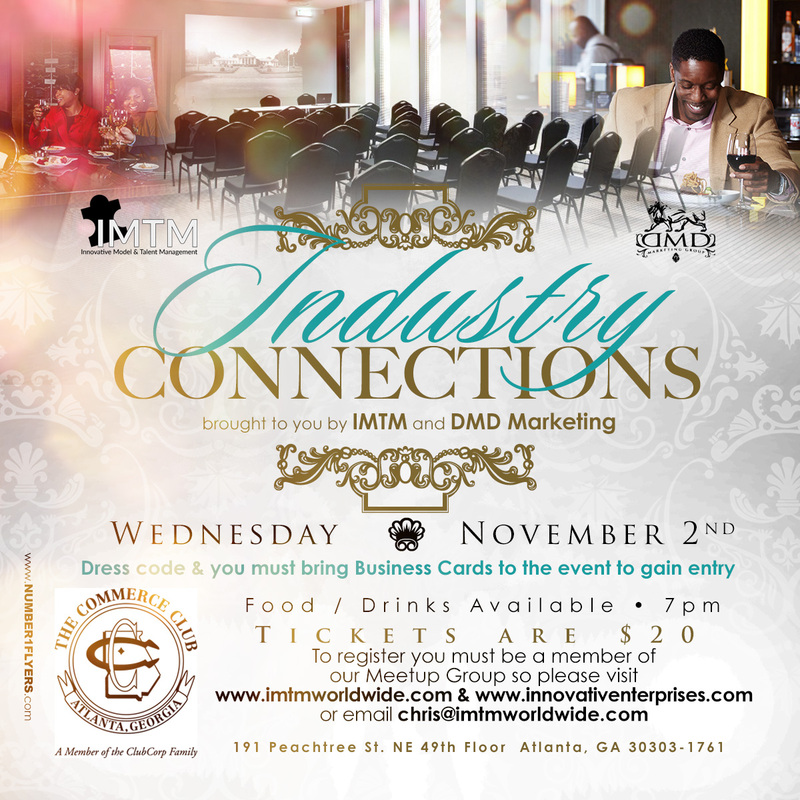 If you have questions, email chris@imtmworldwide.com. Beauty abroad. The Okan Twins are ready to take over….times 2!